FORMER Rangers and Scotland goalkeeper Andy Goram reckons the Ibrox club should try and land John Terry - in a push for Champions League football. WOLVES are preparing to test Hibernian’s resolve with a summer bid for striker Jason Cummings. The Scotland Under-21 striker, who scored a midweek double in a 3-1 win over Northern Ireland, has scored 20 goals this season for Hibs. NIR Bitton has admitted he would relish the chance to land a move to Arsenal. The Israeli midfielder has been previously linked with the Gunners, as well as a number of top clubs across Europe. HIBS head coach Alan Stubbs has insisted he is not interested in selling John McGinn, despite the midfielder’s value likely having soared after he was named man of the match on his Scotland debut. RANGERS manager Mark Warburton believes the team he has put together this season will merit a special place alongside the great sides of the team’s oldco past. THE SPFL and Celtic tried to dissuade the introduction of new laws that would give Scottish football fans a greater say in the running of their clubs, according to The Times. The Parkhead club published a seven-page response to the Scottish Government as they attempted to block new proposals over fan involvement. are paying close attention to West Ham left-back Stephen Hendrie, who may be a possible replacement if Kieran Tierney moves away from the club during the summer. 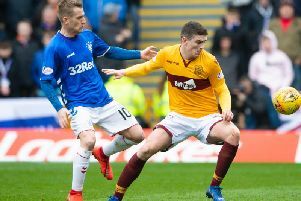 Caley Thistle manager John Hughes has reportedly made a move for the 23 year-old former Scotland under-21 international, with Partick boss Alan Archibald already anticipating losing the player. Bannigan is expected to miss the rest of this season with a knee injury. Inverness have also been linked with Steven Lawless and Abdul Osman, who are both out of contract in the summer. CELTIC defender Erik Sviatchenko has said his team mates were “blown away” by the 45-minute debut of teenage left-back Kieran Tierney on Tuesday night. He added: “I saw his first half from the bench and lots of my Denmark team-mates said, ‘This guy is really good’. Hearts head coach Robbie Neilson has warned Celtic his team have improved since claiming a point on their previous trip to Parkhead. Neilson’s side lost 3-0 to St Johnstone in their most recent game but that followed a run of four consecutive wins and clean sheets. “We have progressed recently. The players that have come in have more experience of the Scottish game, the younger players have more experience of playing first-team football, so I think we are in a better position than we were the last time”, Neilson said. DUMBARTON manager Stephen Aitken has praised striker Christian Nade after he was named Ladbrokes Championship Player of the Month for March. FORMER Chelsea and Dundee United midfielder Ian Britton has died aged 61 following a long illness. The Dundee-born player moved to Chelsea in 1972 and after 289 appearances, returned home in 1982. ST Mirren’s new £70k supporters’ hub has been ruined by floodwater from a burst tap only days before it was set to open. Thousands of pounds worth of damage has been caused and the building’s grand opening, set for tomorrow’s game against Hibernian, has been postponed.